Robert "Bobby" Drake was born to William and Maddie Drake in a small Midwestern Town. He didn't show any signs of abilities until a few months into his 14th year of life. He went swimming in his parents pool when it suddenly turned to ice. It took him sometime to get free with the help of his parents. They warned him to not reveal his powers to anyone so he did his best to keep them a secret. Though he kept them a secret, he practiced in the woods outside of his house learning to freeze the air around him and create ice slides to move through the woods. He found that he also really enjoyed skating and tried his hand at hockey, but it was difficult to keep from altering the ice even accidently when practicing. When he was on a date with a young girl, they were attacked by some bullies. In order to protect her, he froze the leader of the bullies only to have his girlfriend and the entire town turn on him. He was thrown in prison as 'protection' from the police. As the mob outside chanted for him to be slain, a surprise visitor entered his cell. Loki, the Asgardian God of Mischief, noticed the boy's growing power over cold. He broke into Bobby's cell initially under the guise of a guard only to reveal his true form. Bobby tried to fight against him, but he was no match for the power of the God. Loki took him back to Asgard and begin experimenting on the teen. While the young Bobby had the ability to control cold, he wasn't powerful enough to use his power over the frost giants which was Loki's plan. Loki began altering the young Iceman to accelerate his mutation rate and increase his powers. This abnormal acceleration was effective but also very dangerous for the inexperienced youth. Bobby's body completely transferred to an organic iceform. His power became unstable and overwhelming which was exactly what the Mischief-maker wished. Just as Bobby was becoming reaching the necessary power level for Loki to use against the Frost Giants, Loki's brother Thor caught wind of the abduction and torturous experimentation. Thor discovered the location of the secret chamber and broke in to free the young Iceman. Iceman's power was so unstable at the time, that Thor had to protect himself from the ice blasts and from the touch of the youth. Thankfully, Thor was more than a match for the uncontrolled icy bursts. Once Loki had been beaten back and Bobby rescued, Thor helped Bobby get to the Bifrost bridge so he could make the trip safely back to earth. He spoke to Bobby of the Avengers and how they could help him control and train his powers so that he could use them for the betterment of others. As Bobby (completely stuck in his iceform) and Thor traveled along the Bifrost, Bobby was suddenly and inexplicably whisked away. Thor would not find out later that Bobby had been completely pulled from the 1299 universe though he wasn't aware that the young Iceman was thrown into the 616 universe. Now, Bobby hopes to find the help he needs, the help Thor promised. Despite all that has happened to Bobby Drake, he is a cheerful and optimistic youth. He tries to approach any situation with a positive outlook. Bobby is definitely a thrill seeker. Sitting still and quiet is not something that he is particularly good at. For him, there is nothing better than having a good time and test external limits. When Bobby makes a connection with someone, he will be there for them whenever possible. He isn't one to run from danger especially if a friend is in need. He doesn't like seeing his friends hurt either physically or emotionally. Bobby tries to find the fun in life. He enjoys making little quips and jokes although he doesn't always pick the best time. Bobby's initial motivation is to learn to control his powers so that he doesn't hurt anyone and can hopefully even find a way to help people. He would also prefer to find a way to return to full human form and be able to touch people again. Bobby has the ability to lower his internal and external body temperature effectively freezing himself and/or the area immediately around him. This cold can then be directed in any direction though he usuaully directs the cold with his hands towards what he wishes to freeze. Bobby has the ability to see the heat that is given off of normal matter. Because he is able to alter the temperature of things around him, this enables him to see the heat. Bobby has the ability to control, manipulate and form ice. He can freeze even the moisture into the air into any shape that he can imagine. The constructs that he makes are so strong that they have the potential of being able to restrain even the Hulk for a time. He can use this ability to create iceslides for him to transverse at high speeds. He is also able to manipulate the ice of his own body to the point where he can fly. He also has the ability to unfreeze objects by reversing the effect. In this form, Bobby is nearly indestructable though with enough force or heat he can be shattered or melted. He is able to refreeze and reform himself; however, should this occur. He is also able to use water from the atmosphere to repair himself if needed. The rate of repair is affected by the amount of nearby water and the severity of the injury. He is able to form spikes, shields, weapons, and other appendages as the need arises and his imagination supplies. 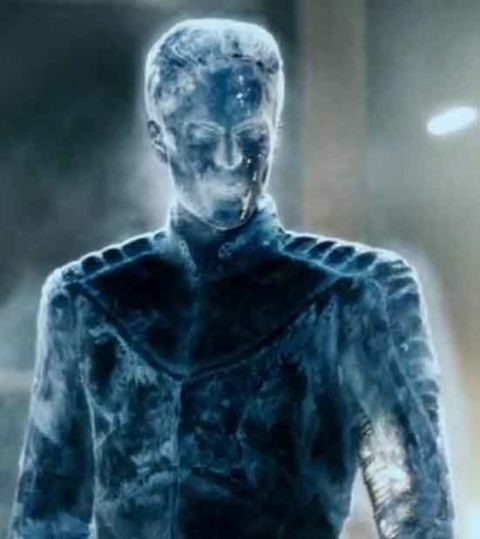 Iceman can manipulate water at the molecular state. This level of control allows him to augment his size and strength by accumulating more water into his organic iceform. He can also convert himself into water and travel through large bodies of water using this manipulation. He can even convert himself completely to vapor and maintain conscious use of his powers. Bobby has the ability to make clones of himself made entirely of ice. The clones have the ability to move, fight, and talk under Bobby's control. Bobby has the ability to transform any organic matter to organic iceform and back to organic form again. Bobby has the potention to spread his very consciousness through ice and perceive all events taking place on or in that ice. Even though this Bobby Drake is from a different universe, the friends of Iceman from the 616 universe will definitely recognize and know the young man. In some ways, they will know his potential even more than he does having seen what the far more experienced and powerful 616 Iceman was capable of. From the XMen to the Avengers, he has many people who know him even if the converse is not true. Since Bobby's ability is greatly enhanced by the presence of water, the sheer abundance of water on the Earth's surface gives him an abundance of resources. The atmosphere contains 37.5 million billion gallons of water in vapor form at any given time or up to 4 of its mass. About 71 of the earth is covered with water though nearly 97 of that is in the oceans. 60 of the adult human body is made of water. Bobby is fluent in Spanish as both his mother and one of his babysitters used to speak to him in Spanish frequently when he was growing up. Iceman is very skilled at skating having skated as a child. As his powers developed, he had to give up both skating and hockey, though he transferred those skills to this ice abilities. Sometimes he forms skates of ice to use to ice skate. Bobby has always been good with math. Before his powers developed, he had thought about going into accounting or banking when he grew up. Iceman has a strong imagination having read comics, played computer games, and watched cartoons most of his life. He uses this imagination in his ice creations. Bobby is athetic having given himself at first to skating and ice hockey. When he gave those up, he begin running track and field which he felt helped him with his endurance for the ice slides he was enjoying creating. The biggest weakness that Bobby has is the fear of losing control of his powers. With the untimely agumentation of his powers, that fear was magnified. The idea of hurting someone with his powers is something that causes him to hold back even if unconsciously. This makes it difficult for him to achieve his full potential. The meddling of Loki has increased his powers greatly, but they were increased beyond his current ability to fully control them. This means that his powers sometimes work in greater ways that he intended or even without his direct control. Not being from 616, there are so many things that Bobby is unfamiliar with here. The only supervillain contact he had in 1299 was Loki, and the only hero contact he had was Thor. Bobby is currently stuck in Organic Iceform until he can gain better control over his powers or get some equipment to reduce his powers to a more manageable level. He cannot eat or drink in this form though he doesn't need to. Also, due to the sheer cold of his skin, anything he touches that is organic will freeze solid. While there is still water in arid climates, the lesser amount of water makes it more difficult for Bobby to use his powers. The use of his powers puts a greater strain on him in these low water areas. Though Bobby is from 1299, all of Iceman's enemies from 616 will recognize him and already hold a grudge against him. This gives them a potential advantage as he will be meeting them for the first time. Due to the age difference between this Bobby Drake from 1299 and the Bobby from 616, Bobby is now left without parents. When he was taken by Loki back in his universe, he had only turned 18 a few months before. His parents were alive and well (technically they are still alive and well in 1299), but the parents of the 616 Bobby are dead in his universe so now he is out on his own dealing with the loss of parents and friends. Bobby is going to suffer nightmares because of all that Loki did to him back in the secret lab on Asgard. Logs tagged with "iceman" or "re:iceman" will be posted below automatically.